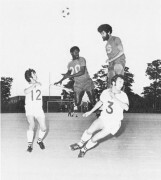 Soccer Their Sport: Here are Penn State's three foreign-born soccer players, left to right: Steve Flamporis, Reading; Per Torgerson, Altoona, and Mike Stollmeyer, Trinidad. Flamporis, team captain, was born in Athens, Greece; Torgerson in Norway, and Stollmeyer in Port-of-Spain, Trinidad, British West Indies. University Park, Nov. 17—While the game is soccer, rather than international diplomacy, Penn State boasts a United Nations all of its own in its quest of intercollegiate amity. Three foreign-born collegians, ranging in age from 19 to 24, comprise what soccer coach Ken Hosterman believes to be the cornerstone of his current team, which is headed for another outstanding year. The three are the captain, Athens-born Steve Flamoris, now of Reading; Norwegian-born Per Torgerson, now of Altoona, and 19-year-old Mike Stollmeyer, who was born and still calls Port-of-Spain, Trinidad, in the British West Indies, his home. 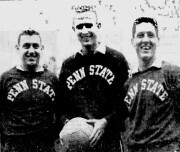 Stollmeyer, 19-year-old sophomore, learned of Penn State through a brother-in-law of his mother, who was a Pennsylvania native, and enrolled without any prior knowledge of its excellent reputation in soccer. Like Torgerson, he was pleasantly surprised by the quality of the college team's play. Stollmeyer, who spends vacation periods with relatives in Mahoney City, plans to qualify for American citizenship and enter the armed forces before returning to the British West Indies. His father, a Dartmouth graduate, is engaged in the lumber and hardware business. Like Torgerson, Stollmeyer is studying for a career in engineering and also, like Flamporis and Torgerson, he can become lyrical about the United States and the opportunities it offers young people. Coach Hosterman, who regards the three as indispensable, says what impressed him most was the eagerness and enthusiasm with which they embraced Penn State's vaunted team play after earlier experience in a much more individualistic type of game.